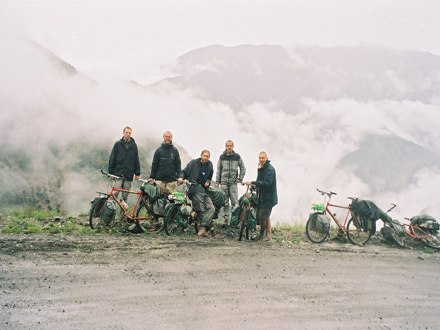 Five young men - including the filmmaker - take a four-month break from their responsible adult lives to travel by bicycle from Mongolia to Nepal hoping to experience old-fashioned travel adventures. Their journey leads them through diverse landscapes and harsh conditions (the Gobi Desert where water and roads are equally difficult to find; the flooded dirt roads and landslides caused by heavy rain in the Himalayan mountains). They are exposed to diverse cultures and meet fascinating people (Mongolian nomads, Buddhist pilgrims, yak herders in the Himalayas). As relationship dynamics develop and change within the group, the five travelers very different natures only add to their journey's drama. Nevertheless, it is the messages from home that have a much larger impact on their states of mind than the daily physical and psychological difficulties that they encounter.